Barcelona hope that manager Tito Vilanova could return to coaching before the end of the season. 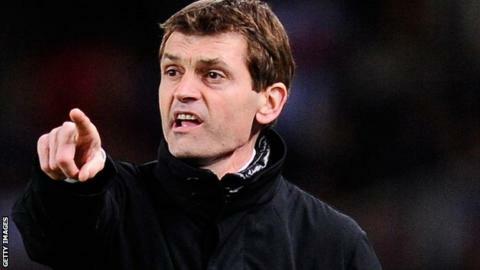 Vilanova has undergone treatment to combat throat cancer following an operation before Christmas. Barcelona lost twice to Real Madrid last week and trail AC Milan in their Champions League last 16 tie. "He is hoping for the process to finish, which is due at the end of March," said Barca president Sandro Rosell. Vilanova, 44, travelled to New York for treatment a month after his surgery, with assistant manager Jordi Roura stepping up to coach the side. "The other day he told me he was happy because he could start the countdown as he is over half of the process and he has less than 50% of it left," Rosell added. "That is very good for his state of mind. He wants to come back and we want him back." Vilanova succeeded Pep Guardiola in June 2012 and Rosell is adamant his return to full health is paramount. "The absolute priority of the club this season is for Tito Vilanova to get his health back and everything else is of secondary importance," the club president continued. "Nothing will change here until Tito returns even if it costs us all our titles this season. I would consider it a successful season if Tito was back to full health by the end of it."